I think having been driven mad by trying to be 'in control' of watercolour, when actually it's not a style I even enjoy. Today I have been going back to 'playing' with watercolour and letting them run together and bleed, and boy did I have fun! At last!! I will be posting the results soon, but in the meantime, here is something even more simple - a quick, ten minute pen sketch of the hallway! I just had to give myself - and you - a break from all of those far too careful watercolours! You achieved a lot in 10 mins. Glad you had some fun. Great idea and great fun! I enjoy sketching in pencil, the simple lines and shading. I've been doing that since I was a child. So when I'm reclaiming a comfort zone, that's where I go to relax! Looking forward to seeing your drippy watercolors! I'm the other way round.. wish I would sketch more and not only focus on watercolour! It doesn't take much time to haul out the old sketchbook and pencil and sit and draw random ideas, does it! Thank you for reminding me to put my sketchbook in my cubbyhole of my car so I always have it on hand. Looking forward to seeing your 'playing' piece Sandra. Now I'm off to paint... have an exhibition coming up end of August! 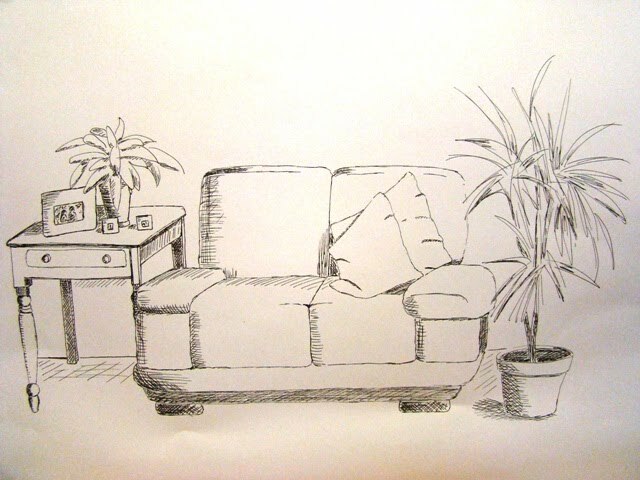 Sue - Thanks - It was so nice to just doodle for a change and not be fussy! Debbie - Thank you! It's been a while since you've been on your blog. Great to know you're still painting! Can't wait to see them! Only just seen this. Although my latest pencil drawing was far from a quick sketch taking 5/6 hours to do, it was the same 'healing balm' for me as your sketch was for you. Sometimes we just get carried along by the flow and it is so good to get off, sit down, and just do what we like doing. Off to do a quick sketch .... and if it turns out half as good as yours I'll be ecstatic. John - I also find drawing very relaxing. Sketching is so much fun because it's a quick and often quirky result. My most favorite drawings I have ever done were my first two posts on this blog and yet they're so simple. It's a shame I find sketching so much more difficult under pressure and when others are around! I was enjoying the watercolours just fine. I do not always comment but I still do enjoy reading and seeing your blog. A perfect, spontaneous sketch! Just lovely Sandra :) I really liked those watercolors, I thought they were beautiful! But I know what you mean, if you don't like to paint a certain way you shouldn't force it. Glad you had fun and I can't wait to see your spontaneous, wet and splashy watercolors!